In Chicago, what would be big anywhere is just so-so here. This skyscraper is a residential tower, and although it looks tall, its only because it stands alone. True, it’s taller than the tallest building in Kentucky, but the surroundings of a building are just as important when it comes to determining the size of a building; One Museum Place, as it’s called, is half the size of the nearby Willis Tower, and one-fourth­ the height of the Burj Khalifa, the world’s tallest building. The Metra line is related to, but distinct from, the normal CTA rapid transit train line. Despite the size and age of the train, it didn’t make much noise as it gently rolled by beneath my feet. I was walking across a pedestrian bridge that gave a flyover view of Grant Park below, with its handsome sidewalks, wide, grassy and tree-filled expanses, and some brave (or typical) Chicagoans braving the crisp March midday. The shade of One Museum Place flooded the pavement from the south. Michigan Avenue marked the western terminus of Grant Park. Again, Chicago sure does put a lot of its best property in the public trust as parks. I remember reading somewhere that, if you sold Central Park in Manhattan for its estimated real estate value, you’d make some $300 billion dollars. I wonder how much Grant Park and the Lakefront would be worth? Alternatively, maybe being so close to the lake is actually a detriment, and the city planners are just clever little boogers. Admittedly, I’d picked 11th Street on a whim, but either way, it was shaping up to be a nice way to get into downtown. A nice hotel on one side, a Best Western on the other, and a satellite college campus farther down the street. I passed a middle aged woman trying to figure out the digital parking meter. Much like Louisville, but on a grander scale, turn-of-the-century buildings crowded against newer architectural stylings. I stopped and tried to find a plaque or something that explained it, but after a few minutes of searching, I couldn’t find a bit of bronze that’d share these wolves’ story. Apparently their origin is somewhat of a Chicago folk tale that originates from a eastern European story, but I’ll be darned if I’d ever heard of it. Until then, they’ll just sit quietly on this corner, looking at the well-worn sidewalk. Ah, the L. Although most of the world’s largest cities have a rapid transit system of some kind, Chicago’s has a certain fondness associated with it. Most establishing shots in Chicago either snag the Willis Tower or a shot of the L rolling through the street. Before walking underneath the Red Line, a northbound train roared by. On the other side of the L, I hooked a right on State Street, recognizing it as one of the cross streets from my directions. Newer architecture always catches my eye, and Chicago’s no exception. I might have just written this as another avant-garde office building, but it didn’t quite have the shape of an office complex. It was too tall for a museum, I’d wager, and too “together” to be a multi-unit building. Oh, it’s a school! Wow, how’d you like going there? Nearby, the school boasted that it was one of the top three prep schools in the country for college preparedness. Well, I could say so; you don’t get the money to build a fancy pants campus like that without being good at your job! At Congress Street, I decided to hook a left, as I was nervous I’d passed my original cross street (Van Buren) on this new route and didn’t want to drain any more phone battery to check. It seemed just as well, as here was a mammoth of a building to gawk at. This is the Harold Washington Library, the main branch of Chicago’s public library and one of the largest public libraries in the world by square footage. The building was fairly new, finished within my lifetime in the early 90s. It had a fantastic look to it, almost like a train station you might see in a Miyazaki movie. Charming, really, and probably a killer view inside and upstairs; looks like the top floor is an indoor pavilion and you can look out from multiple locations onto the street below. Left on Congress Street, across the traffic, and down the walk we went. What an odd building; this building, which housed some part of AT&T’s operations in Chicago, was nearly windowless. It looked much like a cardboard box on end with strips of windows standing in for lines of packing tape. I’d guess that means the center halls were lit by the outside, but that’d be about it. Maybe it was an environmental decision; windows are big heat-suckers, so in the winter, being encased in stone, brick, or concrete may keep that bill down. Still, bizarre. Speaking of bizarre, here’s the Chicago Stock Exchange. I couldn’t tell you a single company that trades here, but they’re here for somebody. For me, they offer a cool tunnel to walk under. It was noisy, to be sure, and every car that whizzed by on either side sent a rumble through the tunnel. The tunnel was lined with purplish LED lights, which almost looked broken up close, as the effect they were going for was kind of lost on me. On the other side, there was a significant amount of construction, but I looked to the Willis Tower for my bearings and I cut north at the next intersection where I came on, sure enough, Van Buren. Just needed to be more patient, I guess. I hooked a left, where I was slated to take the road until Wacker, the road that lined the river and that sidled against the Willis Tower. Now some of the buildings looked old, but this one looked downright Soviet to me. I’m not sure if it was just the hard lines with an attempt at style or what, but I felt like citizens go and comrades come out. Never did really figure out what the building was for, but a government building of some kind is a safe guess. And there it is, the tallest building in the city, and one of the tallest buildings in the country, the Sears Willis Tower! When I was born, this was the tallest skyscraper in the world, and it still feels like it. Man, it’s tall. I’ve seen both the buildings that beat it (the Petronas Towers) and even the world’s tallest building, Burj Khalifa, in the flesh, but this still feels taller somehow. I’m pretty sure that stopping and lining up a shot of the Willis Tower is the most touristy thing I’ve done while I’ve been here, but no matter. I never planned to go to the observation deck for three reasons: I’d already done it years earlier, I didn’t have time, and I’m sure it’d probably be pricey. Going up to the top of Burj Khalifa set me back about 40 bucks, though, so I bet about everything is better than that. One thing I do remember when I was there fifteen years ago is that civil servants (fire/police) and military personnel in uniform got either a serious discount or free admission, and I remember that was the first time I’d ever seen that. I followed Wacker Drive along the western part of the skyscraper. The lobby entrance was there, but it was locked, apparently for some construction or routine maintenance, but the lobby looked pretty neat from the street, and tall to boot. If this thing doesn’t cast some kind of shadow! Rounding the corner, I was engulfed in the building’s profile, and the narrower streets meant the winds blew harder, reminding me of the stiff weather. I was walking down Adams Street now, and people all around me had pulled their coat tighter. Their gazes were all set forward, jaded to the impressive buildings and city that surrounded them. At the intersection of Adams and Dearborn, a festival was underway. I’m not sure what it was for, but food was a pretty good blind guess; there were all sorts of really unique smells and sounds coming from the plaza, all sitting next to a bizarre red statue, apparently called the “Flamingo.” It was specifically commissioned to contrast with the modernist skyscrapers around it, adding color and curved lines to an ostensibly drab environment. The plaza beside it was now host to something called the “Nowruz” parade, which had all kinds of cultural displays and food, perhaps Middle Eastern or West Asian. At this point, though, I just had to press on. Another three or four blocks and I emerged back on Michigan Avenue, which seemed to have widened a bit. A large gathering of people on the western side of the street were waiting for the signal to cross, so I joined them and, when the light turned, we moved as one mass across the venerated Chicago road. On the other side, we split apart, some off to the Art Institute right there, some south to another destination, but I went north, towards Millennium Park and the next mark on my list. Millennium Park had a number of sculptures and installations that identify it as a significantly newer addition to the city than the historic Grant Park to the south. I was here to see one of the most visually striking ones, Cloudgate. Before that, though, I encountered two large, rectangular pillars. They didn’t look like much; they were tall, black, metallic, and separated by a couple hundred feet of empty concrete. The northernmost one had a man inside it, accomplish work, and there were a couple kids and their parents that were able to see him behind the metallic mesh; the worker kindly waved and returned to his task. Cloudgate looks like a super-sized drop of mercury suspended in an open plaza. Lots of families, kids, teens, and college students were all snapping their picture against the sculpture or off the sculpture, capturing warped, fun-house pictures. I actually was able to find my own reflection in the sculpture, even at this distance, by waving and looking for the little arm waving back near the top. They do concerts here, too; the angles of the pavilion, and perhaps the purpose of the venue, reminded me of the ArtScience Museum in Singapore, which features architectural stylings akin to a lotus in bloom; it even unfolds throughout the day and night. It had a lattice that overhung the grassy area to the south of the pavilion, mostly as a way to hang lights. Maybe you could even stretch some kind of roof over the lattice in case of rain? I made my way back to Michigan Avenue, but just to cross it again; we’ll pick it up again on the north side of the Chicago River. For now, it’s time to roll down Washington Street for a couple more sights. I was amazed by how many paved, open spaces there were in the city; Chicago really knew the importance of having a lot of outdoor space, and that really surprised me. I guess I always assumed Chicago’s weather would be bad, but I’m not sure millions of people would call the Windy City home if windy was all it was. The other places I can think of that have this kind of atmosphere are Washington, DC and San Francisco. The statue honored a former mayor, as I recall, but now, some kids were using its smooth, brushed edge as a slide. More power to ‘em; it almost looks designed for it. If you can believe it, this skyscraper was a church; churches are known for being spread out over large spaces, but this one has left a proportionately small footprint. By using up the real estate of a modest sanctuary, this church has fit everything it needs, which probably includes its main worship space, offices, classrooms, nursery, and maybe even a rectory. Never thought of a preacher living in a penthouse, but that might be the case here. I hooked a right along the open plaza and walked north along Clark Street where I encountered one of the odd buildings I’d expected to see on my route. This is a government building. Yeah, not an art gallery, movie theater, mall, or spaceship like I expected. Beats the pants off Soviet Central a couple miles back, though. This building houses the Chicago side of Illinois’ state government; Springfield, not Chicago, is the state’s capital, but they’ve got a lot to do here. Just a couple more blocks and I was at the river again, ready to cross and see the city’s newest skyscraper, the Trump International Tower. It’s the taller, silver building on the right, but the other tower in the shot fascinated me, too. I wanted a closer look, so I adjusted my route to cross the river right there. As I crossed Wacker Drive to get ready to take a bridge across the river, I was quickly reminded of the cold. Having pavement that’s soaking up sunlight is one thing, but with the open air and cold river beneath me, it was downright cold again. I tucked me hat down and stashed my hands in my pockets again, as I did when I’d first set out hours earlier. I found my cross street and took the Dearborn Street Bridge across to these bizarre towers. They’re parking garages; how novel! It looks like, if you wanted to park there, you drive up a spiral center road and park along the edge. I’ve seen enough action movies that I know what it’d look like for one of those cars to go careening out of its spot, hurtling down to the river below. More than anything, I guess, they were made like a screw, and you drive up and down the threads to get to your spot. Still, it’s a pretty fashionable way to do something as mundane as park your car. The Trump Tower was tall and skinny, unlike the broad, blocky Willis Tower. It was the second tallest building in the city, but it didn’t seem much taller than many of the other skyscrapers I’d come across, and it may be because its footprint was smaller. 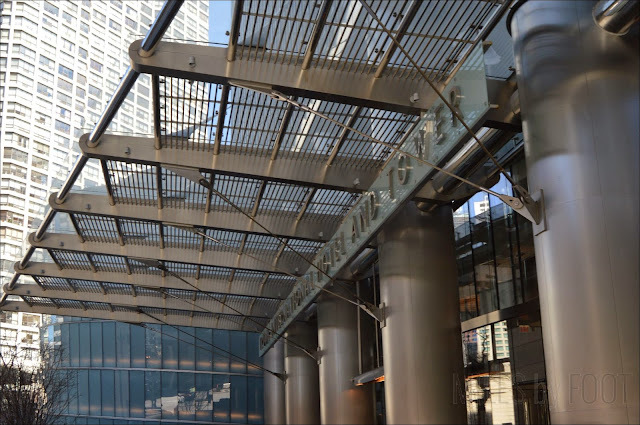 After getting to the parking towers, I followed the elevated waterfront around to Wabash Avenue and walked alongside the supertall building. It was certainly fancy; it made me think of Monopoly. When you put a hotel on, like, Baltic Ave., this would be what it’d look like. You’d charge a ton of money, but you created the value. In other words, if you spent a lot of money here, I just feel like it wouldn’t be a good deal, but I’m probably biased. I mean, I’ll take a sleeping bag or a cot and I’ll be fine. I’ve stayed in some really fancy digs and some shacks, and I’ve never seen the point; you wake up all the same the next morning. Frankly, this building was just about as interesting. Something about Chicago and their parking structures, I’ll tell you what. This was another garage, hidden behind a vertical, metallic mesh. You could see inside, but just barely. It might keep the wind at bay without the trouble of building actual walls. I’m sure some would call it ugly, but I think it’s pretty baller looking. At Hubbard Street, I hooked a right and followed the elevated sidewalk to Michican Avenue, where’d I’d follow it north along the ritziest places in the city and out to the lake shore on the other side. While I was given an option of going under or over the next bridge, I decided to stay topside, and the next block up was Michigan Ave. They call the stretch north of the river “the Magnificent Mile,” but it would be more like “the Magnificent 3500 Feet” for me, as I picked up a bit into the game. Still, there was already tons to see, and people were swarming over the sidewalks, sightseeing, shopping, and sharing experiences with their companions. This may come as no surprise to you, but some of the most modern architecture I found was for the flagship retail stores based on Michigan Avenue, like this Burberry store, which was even so clever as to include their signature plaid pattern on the exterior. I may not be a fashion guy, but I at least know that. You don’t make a purpose-built investment like that unless you can really be sure that you’re going to be able to stay there for a long time. I know most law firms or sanitation departments wouldn’t like a flashy, plaid-patterned building to house their offices. Crate & Barrel was even being cute with their architecture, with a typical, square portion (the “crate” and a rounded foyer and atrium (the “barrel.”) Truth in advertising! Naturally, there’s lots of street performers too. Any Saturday, regardless of weather, I’m sure you’re bound to find performers plying their trade for spare change and small bills. It’s easy to write these performers off, but they are generally pretty good at what they do. Just because they don’t have a 9-to-5 doesn’t mean they aren’t doing real, valuable work. Amongst all the hip and the new, this historical water tower now houses an art gallery. It’s nice that the kept the building though; Louisville also sports an historic water tower. In fact, our wedding reception was there. Speaking of my wife, this is for her; when we were dating, we picked up a Playstation game for $1 at the local Dollar General. Although I can’t remember the full name, the title had “Topshop” in it. It was a mix between Monopoly and a tycoon-style game, where you buy up space in a mall to sell different things and you can sabotage each other, take over floors and push others out, etc. This actually looked like one of those kind of places, with several different kinds of stores jammed into one location, vying for space and customers. The last major skyscraper I’d pass before leaving the city proper was coming up on my right: the John Hancock Center. This trapezoidal tower tops 1,000 feet and was, in fact, the first skyscraper outside of New York City to hit that milestone. Intriguingly, the Hancock Center seemed to take itself much less seriously than the other supertall buildings I’d encountered so far. There was a little place to eat, several restaurants, and even in a Best Buy in the first few floors. Admittedly, it is in a different part of the city, so it could just be they’ve adapted over the decades. As has often been the case, churches are some of the last remaining historical buildings in most downtown areas. In this case, it seemed like it was only partially remaining; was there always only one spire, or did the right one collapse? It looked unbalanced, but kind of awesome at the same time. I guess I’ve got either the architect or mother nature to thank. Finally, I reached the northern edge of Michigan Avenue where it collides with Lake Shore Drive. My next target, Linkin Park, was still a couple miles away, so I wanted to ride the coast again. There was a pedestrian tunnel at the intersection, so I followed it. This one was longer than those I’d encountered on the south side of the city, and it certainly had something distinct waiting for me on the other side. This is a beautiful mural; often Martin Luther King is depicted, either in photographs or artwork, as heroic, divine, or infallible. The angel’s wings on either side might normally indicate that, too, but I actually see something else. Dr. King’s here face is focused, somber, almost angry. Dr. King’s efforts were so powerful because he worked. He struggled, and he suffered, and he eventually died for those who had been treated as less than. He was peaceful when it was appropriate, and he was baleful when that was appropriate; King was arrested more than two dozen times during his life. Especially in these turbulent racial times, Dr. King’s approach to destroying both idealistic and legally enforced racism stands as an example of diligence, focus, and determination. We’re more than halfway there; come back Wednesday for the sixth installment. Until then, keep going! This is the fourth installment of this journey; here are the links for the first, second, and third installments. The train tracks roared beneath me as a train passed, and soon I was on the other side of the old iron bridge to the lake front, where I’d travel along the trail for a while. I crossed Lake Shore Drive, a non-interstate highway that follows, you guessed it, the lake shore both south and north of the city. The end of the bridge had a stone and iron switchback staircase. As I hopped down each step, I was reminded of going to visit my wife when she was in undergrad; the parking garage’s staircase was built the same way. It was one of those that go down the center of the structure, curl around to the outside, then back to the center with each level. It’s basically two mirrored staircase slapped together. The Lakefront Trail is the pedestrian path that parallels the highway, and it meanders through a large greenspace along the whole length of the whole city. The park that surrounds it is unique. In most cases, lakefront properties would comprise the most attractive real estate in the region, but here, grass is the biggest tenant. If I need to remind you, it was cold. At this point of the walk, even with the sun out and beaming, you’d be hard pressed to find anywhere in the city that was even close to breaking the freezing point. Thus, the lakeshore was particularly chilly, as there weren’t any obstacles to hinder the wind. To add to my discomfort, my stomach rumbled, announcing it had digested my first protein bar. I consumed a peanut-butter-flavored one, and it wasn’t bad. I have literally no idea what this is supposed to be; lifeguard stand? Visibility beacon? Abandoned gibbet? After getting sprayed overnight with lake water, the freezing temperatures have turned this metal pole, and everything around it, into a frictionless popsicle. I pretty much had the park to myself, but there were a few runners. Chicagoans are made of foam insulation and whale blubber, apparently, because this guy is running in little bitty shorts. I’ve heard some runners make the argument that you run in loose-fitting clothing no matter what the temperature is, but I prefer to be warm and chafed then freezing and breezy. No thank you; still, good on this guy. Even in warm clothes, I had several moments I thought twice about lengthening my total distance, so I can’t imagine his dedication. After the runner passed, I decided to get closer to the icicle pier and I found something pretty bizarre. As I approached the beach, which was much like an oceanic shoreline, grassy earth merged into sand. Of course, this had the distinction of being completely frozen. One step on the grass and my foot glided along the top of glare ice. I stumbled back onto the dry grass. I took a pebble on the ground and skidded it along the top of the ice. It skipped and jumped with each bump of frozen grass, but it went probably a hundred feet before coming to a stop. The whole thing was surreal. This was a beach, but it was not only below freezing, the beach itself was frozen solid. To make it worse, the sky was as clear as a bell, and the sun was shining brightly. It was an otherworldly experience; the last large-body shoreline I saw was in Matara, Sri Lanka on the southern coast of the Indian Ocean. This is, to say the least, considerably different. I gazed out into the lake and saw an offshore pier. Well, I think that’s what I saw. I switched lenses, took this, and zoomed in on my camera. Still not totally sure what it is. Whatever it is, it strikes me as crazy that it’s in a lake. Lake Michigan is massive, and it’s actually large enough that it contains large ships and installations. It has access to the ocean, so given enough fuel, I could hop in a boat and go to any coastal city in the world without leaving the boat. That’s hard to get my head around considering Chicago is near the center of the continent. One of the reasons I chose to walk along the waterfront, besides the fact that I like to walk near water, is the view it provides to the city proper. Chicago is a pretty flat area, and the closer you are to the lakeshore, the better, as the land is low (or lake-level), and there’s not much in the way either. When I was a kid, I would define a city by the general size of the skyline. In fact, I wouldn’t call it a “city” if it didn’t have several tall buildings. It needed some kind of skyscraper in my mind; so I’d call Indianapolis, Cincinnati, or Nashville a city, but Lexington, which really only has one “skyscraper,” wouldn’t be one. It needed a distinct skyline, and Chicago not only has a wide skyline, but a diverse one, too. I found a harbor, again, much like you’d find on an oceanfront. It was pretty empty and quiet this morning; I wonder what happens if you have a boat moored at the harbor and the lake freezes? It’s not out of the question, as I know that the shore areas have become icy before. Does it break the boat, much like an overfilled frozen water bottle breaks the plastic? The breeze was picking up, and the cold prodded me on, so I crossed over to the western side of the park, following the designated path. When I was in high school, I was really into skateboarding; I got a board, rode goofy, and never did so much as one trick I can be proud of. I got lots of bruises and cuts over the years, the most dramatic one involving striking a pebble at full speed which stopped my front wheel hard, launching myself head-first into our storage garage. I received a vicious bruise the size and shape of an open hand on my side, but with no broken bones or missing, I’m sure that’s all any parents could hope for. Louisville actually has a very nice skatepark, which I’d been to a few times in my skateboarding phase. I couldn’t even drop in successfully, so it was mostly to watch people better than me. Louisville’s park is perhaps twice the size of this one and it has a full-size, 360° concrete loop, so at least my hometown beats a world-class city in something. Planespotting in Louisville is one thing, but because some of the biggest planes in the world fly into O’Hare, you’ll get some neat flyovers on a daily basis. I snapped this shot at max zoom to determine later what it was. 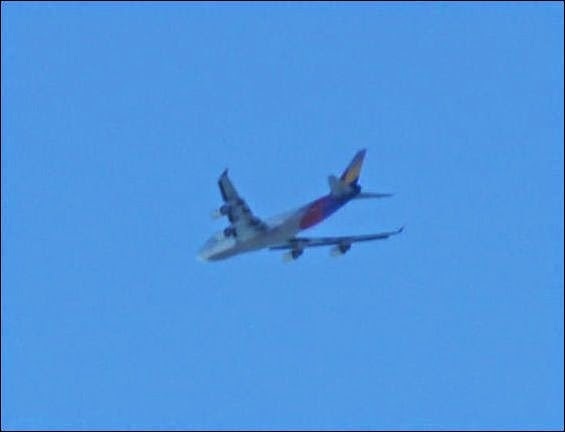 It had four engines, so it was most likely a 747 (there are only three passenger airliners that use four engines), and the colors indicated it was an Asiana Airlines 747. Asiana flies a non-stop flight from Seoul, so this one had come a long way. Just about forty-five seconds later, I saw another one, but this one was outbound. 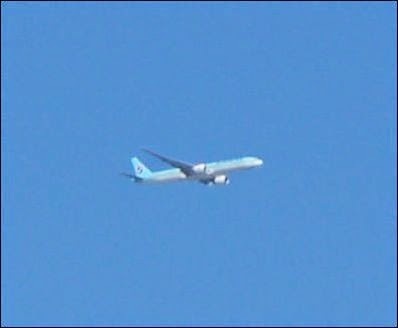 Now I could tell this one’s color from the ground and knew immediately what it was; this was a Korean Air 777 heading, funny enough, to Seoul. The two planes would have likely passed each other in the air, each flying the same route. How about that? The trail came to a crossroad, connecting it with a typical vehicular road, so I turned left onto 31st Street to continue inland. I crossed back over Lake Shore Drive, the commuter railroad, and paused at a school on the south side of the street. This elementary school was named after John Pershing, the famous World War I general that led American and her allies to defeat the Germans the first time around. Although I don’t know any connection he had to Chicago, I suppose there’s stuff all over the country that’s named for presidents, dignitaries, and social revolutionaries that have no affiliation with the city. My undergraduate alma mater named its fitness center after George H. W. Bush, and they flew him in to give the dedication address. It was just a publicity stunt, but I went anyway, and it was cool to see a former president in the flesh. Maybe John Pershing did the same thing. Anyway, this little portable sat west of the main building. If you read my March posts, you’ll know that I spent the latter half of my elementary school inside one of these temporary classrooms, but this one was decorated. I wonder if the kids did it; maybe they added onto the display every year. A large complex of apartment buildings stretched out to the south. I always think it’s fascinating that every large building is its own little town; hundreds of these buildings probably dot the landscape of Chicago, each its own city. Someone on the 5th floor of the second building back on the left could have just had a baby. Maybe someone on the 14th floor of the first building on the right just got a job promotion that will help stabilize the family’s finances. Everyone has a story, and we’re ignorant to so many of them. Just down the road, I found my crossing onto Martin Luther King Drive; I crossed 31st Street heading north and began my next long stretch. This wide thoroughfare featured large apartment buildings on the east side of the street and a divided, eight-lane highway on the west side. Despite its size, it wasn’t terribly busy this morning. Dunbar High School is a prominent high school in the city; it shares its name with a big high school in Lexington, too, in the western part of the city there. A bit of research confirmed that they were, indeed, named after the same person, and this Dunbar High School has some pretty famous alumni, including Jennifer Hudson and Mr. T.
Alternative styles for bus benches are one thing, but I actually have no idea what this is supposed to be, acknowledging that it may not supposed to be anything. It looks like an abstract spatula being held to the bench by three over-exaggerated nails. As I snapped the shot, a lady waiting in the bus stop beside the bench gave me a funny look. Well, the bench gave me a funny look, so that’s understandable. The apartment blocks stretched along the entire length of the drive so far; all of them looked roughly the same, so I feel like it’d take a lot of experience in the area would be required to not drive or walk up to the wrong one time and time again. This nifty bronze statue sat in a small, circular plaza in the center of Martin Luther King Drive. I was concerned on how to actually get over and see who it was, so I kept my pace. When plotting out the trip, I incidentally passed through a place called “McCormick Place.” Even looking through a Street View, I couldn’t quite figure out what McCormick Place was; a mall, perhaps? A sports arena? I’d be making my next turn once I passed McCormick Place, and the directions were making me nervous, so I pulled out my phone at the stoplight. It still had 60% battery, so I brought up my map application to check my location and the crossroad I’d need to cut over to Soldier Field, which was another “take the stairs” kind of direction. The light changed and I galloped across the crosswalk and under I-55. Apparently, this little part of Chicago is called Bronzeville, so that anonymous bronze statue makes a lot more sense! If I had to take my guess, I’d say that McCormick Place is a convention center; the huge drop-off areas, mammoth floor plan, and broad lanes to ferry thousands of cars a minute. Also, it had multiple buildings on both side of the street. I ducked into the portico on the right. While normally I’m sure this would be teeming with carpoolers and large cargo trucks, the convention center, or at least this part of it, was deserted. While I was out on the sidewalk, it felt like I was in a large city. Here, though, the sound was the only indication that something was going on outside. Chicago’s ABC station is one of their more famous affiliates; they’re responsible for the Oprah Winfrey Show. The fact they’ve got a news van here tells me there might actually be something going on today. Yeah, there’s definitely something going on. The crossing guards saw me standing at the crosswalk, but they assumed I was interested in crossing that way; that’s fair, as I was taking pictures of the place and really, why else would I be there? He waved me across, along with a couple other pedestrians who’d joined me. I thought about it for a second and said, “why not?” I crossed with the rest of the mob and we made a beeline for the door on the other side. I came into a tall convention hall, several floors tall and wide open. I followed everyone else to the second, then the third floor. Many wore green shirts and running shorts, and there were booths set up around the convention space signing people up for raffles and charity items. One women had a bag with “Shamrock Shuffle” on it; the Shamrock Shuffle is a marathon event that Chicago hosts every year and it was to take place the following day. As the day before race day, I’m guessing this is where they do their pre-race stuff. I couldn’t tell whether it was a run for charity (though a name like Shamrock Shuffle would suggest that), but everyone in the building was happy and excited. While they’ve got a fun day planned tomorrow, I won’t be here tomorrow, so I had to keep moving. I plodded back down the stairs and back out onto the street. I continued around the bend, knowing that my cross street was across the road; I galloped across and checked my phone. That was just from fifteen minutes of running Google Maps in the background. I was around halfway done with my walk and my phone was hemorrhaging battery power. I quickly closed every app, dimmed the brightness all the way down, and I considered turning off the cell signal. I would have turned it off, but my phone’s off switch is broken, so if I turn it off, I can’t turn it back on without plugging it in for a considerable period of time. I kicked myself for forgetting to close my map app; rookie mistake. I’d have to sip on my battery until I got to the airport, I guess, because I wasn’t planning to stop somewhere and let my phone charge. This crossroad is little more than an alley lined with newer apartment buildings. To the left, I saw something a bit unique. When I saw this, I considered what this meant. I’m imagining a library of guns, with little tables with certain kinds of bullets in each drawer. I’m sure it’s not so simple, but it is a huge building dedicated just to guns and ordnance; it’s gotta be filled with something. Shortly ahead, a sign pointed to Soldier Field, one of my walk’s main anchors. It directed me to a tunnel to my right, where I’d pass under the commuter rail line and pop out near the stadium. A series of tunnels, it turned out. Because I’m not doing this on a game day, I just had to imagine the thousands of spectators wandering through these tunnels, looking to catch a home game of the venerated Chicago Bears. The Bears are one of those teams that aren’t as flashy or consistent as teams like the Patriots or the Packers, but they’re always there, doing their thing, playing their games. They’re another one of those All-American things I associate with Chicago. Soldier Field, named as a memorial for the country’s veterans, is the oldest extant professional football stadium that’s still in use. It was built over a century ago and although I’d been to Chicago many times, I’d never been here. It looks older than other stadiums, never mind the modern addition over top the field. The stadium’s outward-facing structures were made of stone, not metal and fiberglass like more modern stadiums, and the sculpting and details are classically styled. Along the side, it bears actual stone columns. It feels more like a gladiatorial stadium then somewhere where hilariously wealthy athletes smack into each other’s padded uniforms every play. The stadium was huge, and the stone façade definitely contributed to the immense feeling of smallness I felt as I walked along its length. Soldier Field is one of those classic Chicago locales, and so much of the area gets its identity from this mammoth stadium. The city really does owe a lot of its personality and social brand to its sports teams; some of the greatest sports stars in history have cut their teeth in this city. To walk past one of their greatest schools of learning is an honor. Although I'd never put two and two together, the Field Museum is named after its neighbor. I suppose I'd always thought the "Field" was for a person. I don't know, maybe Sally field was a historian in her spare time. Much in the style of its more famous neighbor, the Field Museum was a grand, classically-styled museum. Nearby, the Shedd Aquarium, which was on the edge of the lakeshore, attracted plenty of undersea explorers on a Saturday morning. I needed to make my way downtown, as Vanessa Carlton would say, but I couldn't go left; Lake Shore Drive was impassible at this grade. In the hopes of finding another tunnel as I'd found before encountering Soldier Field, I crossed the parking lot beside the Field. I love museums; my wife, who offered to come with me on this walk, loves them too. We'll have to come back sometime and hit them up; Chicago has so many good ones to choose from. It was a pity I couldn't stop and explore here. Alas, most of today's exploration was outside. It bears noting that I'd finally become accustomed to the cold. My face wasn't numb, but it was hardened; the skin of my cheeks was dry and my nose was stable, though probably pink, if I took a guess. My attire choices turned out to be just enough. In front of the Field Museum's north entrance, a grassy hill descended to a stone path and one of those hoped-for underpasses. The lawn was well-tended, even in early spring, and I debated whether it was a no-no to cross down as opposed to walking around to the sidewalk like a normal person. Nah, there were kids playing at the foot of the hill, so I thought I'd join them. I leapt down the hill at a run and rounded the corner into what's apparently called Grant Park. I took a trip underneath it and emerged on the other side; an SUV belonging to the Chicago Parks Department passed me right on the sidewalk as I came out. Judging by its wide sidewalks and sparser vegetation, Grant Park probably saw much more foot traffic than the Lakefront Trail. Michigan Avenue: the most famous street in Chicago. After traversing under the most notable street in Chi-town, I'd be downtown. The best, most exciting buildings and the hustle and bustle of the city awaited just through there. I couldn't wait! Part five will be up next week, so come back and join us. Until then, keep going!